Definition at line 78 of file fs.h. Definition at line 81 of file fs.h. Referenced by create_bad_block_inode(), ext2_mkdir(), Ext2CreateInode(), Ext2ProcessEntry(), Ext2SetFileInformation(), and RfsdProcessDirEntry(). Definition at line 86 of file fs.h. 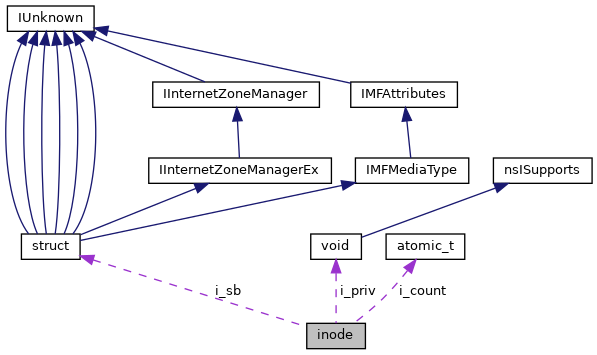 Referenced by create_bad_block_inode(), ext2_block_map(), and ext2_mkdir(). Definition at line 85 of file fs.h. Referenced by create_bad_block_inode(), create_lost_and_found(), ext2_block_map(), ext2_mkdir(), ext2_write_inode(), ext3_inode_blocks_set(), ext4_free_blocks(), and ext4_new_meta_blocks(). Definition at line 90 of file fs.h. Referenced by iget(), and iput(). Definition at line 82 of file fs.h. Referenced by create_bad_block_inode(), ext2_mkdir(), Ext2CreateInode(), Ext2ProcessEntry(), Ext2RemoveEntry(), Ext2SetFileInformation(), and RfsdProcessDirEntry(). Definition at line 84 of file fs.h. Definition at line 99 of file fs.h. Definition at line 100 of file fs.h. Definition at line 94 of file fs.h. Referenced by Ext2CreateInode(), ext3_inode_blocks(), and ext3_inode_blocks_set(). Definition at line 92 of file fs.h. Definition at line 89 of file fs.h. Referenced by create_bad_block_inode(), create_root_dir(), ext2_mkdir(), and Ext2CreateInode(). Definition at line 79 of file fs.h. Referenced by add_dirent_to_buf(), Ext2AddDotEntries(), Ext2CreateInode(), Ext2ProcessEntry(), Ext2RemoveEntry(), Ext2SetFileType(), ext3_is_dir_empty(), ext4_inode_to_goal_block(), and journal_init_inode(). Definition at line 87 of file fs.h. Referenced by add_dirent_to_buf(), create_bad_block_inode(), ext2_mkdir(), Ext2CreateInode(), Ext2ProcessEntry(), Ext2RemoveEntry(), Ext2SetFileInformation(), Ext2SetFileType(), ext3_should_journal_data(), ext3_should_order_data(), ext3_should_writeback_data(), and RfsdProcessDirEntry(). Definition at line 83 of file fs.h. Definition at line 91 of file fs.h. Referenced by Ext2AddDotEntries(), Ext2RemoveEntry(), ext3_dec_count(), and ext3_inc_count(). Definition at line 97 of file fs.h. Definition at line 96 of file fs.h. Referenced by __ext4_journal_start(), __read_extent_tree_block(), Ext2AddDotEntries(), Ext2CreateInode(), Ext2ProcessEntry(), Ext2RemoveEntry(), Ext2SetFileType(), ext3_append(), ext3_bread(), ext3_inode_blocks(), ext3_inode_blocks_set(), ext3_is_dir_empty(), ext3_journal_start(), ext3_should_journal_data(), ext3_should_order_data(), ext3_should_writeback_data(), ext3_update_dx_flag(), ext4_ext_get_blocks(), ext4_ext_grow_indepth(), ext4_ext_insert_index(), ext4_ext_remove_space(), ext4_ext_space_block(), ext4_ext_space_block_idx(), ext4_ext_split(), ext4_free_blocks(), ext4_inode_to_goal_block(), ext4_new_meta_blocks(), journal_blocks_per_page(), journal_init_inode(), and reiserfs_file_data_log(). Definition at line 80 of file fs.h. Referenced by create_bad_block_inode(), create_lost_and_found(), ext2_mkdir(), ext2_write_inode(), Ext2ProcessEntry(), ext3_append(), ext3_is_dir_empty(), journal_init_inode(), reiserfs_update_sd(), and RfsdProcessDirEntry(). Definition at line 88 of file fs.h. Definition at line 93 of file fs.h.